“Standing in a dark, crowded room you can feel the anticipation from the crowd. People are filing in, slowly staking claim on their spot on the floor. You watch the room fill in around you, as the lights go down and suddenly this room full of strangers are instantly connected as the atmosphere in the room is directed toward the stage. Your favorite musician has taken the stage. Usually, I am not one to enjoy a concert experience. Crowds make me anxious, the words “General Admission” just make me think of sweaty crowds of people spilling beer, and most of the time the music doesn’t sound nearly as good as it does on the record. There is one exception to this, for me. I will travel far distances to be in the crowd at an Andrew McMahon show. His music has been a huge part of the last ten years of my life. It started with one song, showcased on my favorite television show and a trip to the music store, back in the days we had music stores. I bought the Jack’s Mannequin Everything in Transit album and it remained in my car’s CD player for the majority of the life of that car. I knew all of the words to every song and felt a connect to the music that I had never felt before. When I realized they would be in Detroit for a concert that winter, I immediately bought tickets for my sister and I for Christmas. Little did I know, she had the same idea. Thankfully my mother managed to make sure only one of us purchased the tickets. Waiting in line on that freezing February evening, in downtown Detroit, saying I was annoyed would be an understatement. We were in line blocks away from the venue surrounded by screaming teenyboppers. It was the first concert I had been to in a venue that primarily had general admission, no chairs or tables, just a room full of bodies. We found an elevated spot to call our own and waited, for what seemed like hours, for Jack’s Mannequin to take the stage. The crowd erupted once Andrew walked to his place behind the piano and before I knew it I was in for the most impressive show of my life. You can tell, by the way Andrew performs that he loves what he does, he has fun, he jumps, dances, and practically beams from behind his mic. I was hooked. I didn’t realize at the time but, later my connection to this man and his music would only strengthen as I learned about his battle with leukemia. In his early 20s, Andrew was diagnosed with leukemia and ultimately underwent a bone marrow transplant. Before a few months ago, I had no idea what that meant and couldn’t relate to the year his life was put on hold. Since that first show I have seen Andrew McMahon perform three other times, once just this last weekend in Grand Rapids. 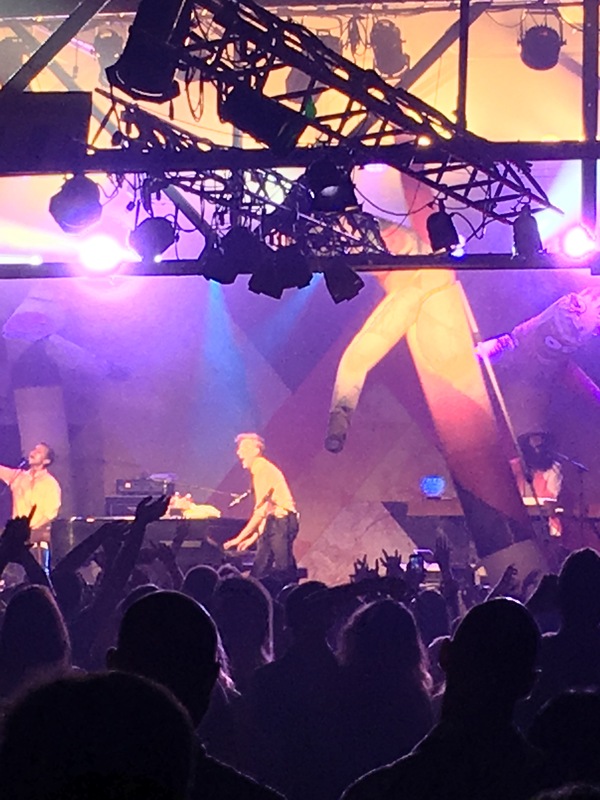 My sister and I drove the 143 miles on a Thursday evening to pack in with the rest of crowd to see Andrew McMahon in the Wilderness perform, and for a couple of hours we were all transformed to an alternate universe, listening, singing, dancing, and laughing. The week before we left, I found myself sitting at home browsing the list of documentaries available on Netflix. I came across “Dear Jack” the film about Andrew’s battle with leukemia. I spent the majority of the following hour crying as I watched this musician that I adored go through this fight I knew inevitably would be something I’d watch my husband go through. I was thankful for the opportunity to see it, but also terrified. Everything became very real, very quickly. It was oddly comforting to see that the man who made my favorite music knew about this world and used his experiences to push forward in his art. It wasn’t a coincidence that I found myself, new concert t-shirt in hand, standing in a room full of people listening to his story all over again. Eleven years post transplant and I was one of the many in the crowd, cheering him on. As usual, there was a table in the back of the venue taking registration for bone marrow donors. With tears forming behind my eyes, listening to the music of my favorite musician, I joined my sister at the table and officially became a member of the bone marrow donor registry. This post was originally posted in July 2016, to read more about The Dear Jack Foundation, go to my Product + Causes page. Let me set the stage for you a little bit. It’s a gloomy, December Saturday morning. I am settled in the corner of our sectional in our living room. I’ve always had mixed feelings about this room. When my grandma lived here, she never really used it except for company, so making it cozy while also not feeling like we’ve disturbed the perfect room has been difficult. The baby blue carpet is covered in urine stains from the puppy we brought home a year ago, the front window is covered in dog nose smudges, and there’s little chunks of sticks hanging around because Winnie (said puppy) sneaks them in with her after she plays outside. Bruno, our almost four-year-old, pit mix is cuddled up at my side, trying to catch some relaxation before Winnie runs over to force him to chase her. The Office is playing on the TV, the Christmas tree is lit in the corner, and the dishwasher is running behind me. I’ve got a cup of Trader Joes’ Wintery Blend Coffee sitting next to me in my “Everyday I’m Hustlin’” mug. My bangs are sticking straight up because they’re fried from my crappy old hair straightener. This is not your picture perfect, curated photos, search engine optimized, influencer blog. I’m just a human, who wants to empower other humans to live their best lives, and sometimes that means sitting in a day-old t-shirt, with your bangs sticking up in the air, not worrying about the old pee stains on your carpet that you can’t get out. Life is about balance, and feeding your soul. But, in order to feed your soul, you have to know what it needs. I’m still figuring that part out, but that’s part of the fun. I’m Emily. Detroit-ish born and raised. I was born in 1985, the year of Back to the Future and The Breakfast Club. I have a degree in social work, but I translate that into a passion for story-telling, empowerment, and kindness. I have a Master’s degree in sarcasm and afternoon naps. I knew I was going to marry Justin at 16. We were hitched 9 years later and adopted endless (four) animals in the following years. I take my coffee with a little bit of cream and sugar, but can also slam a Grande Nonfat Caramel Macchiato like it’s nobody’s business. I love: road trips. diet coke. graphic design. tacos. the office. northern michigan. notebooks. instagram. dry erase boards. crystals and oils. muted colors. thanksgiving. Andrew McMahon. milk chocolate. snarky coffee cups. tv quote conversations. brainstorming sessions. yoga pants. crafting. avacados. I hate: glitter. cottage cheese. lies. updating apps. grocery shopping. fake tv drama.